My wife and I just moved to Seattle. There was a long road trip involved, complete with a stop at Disneyland with the family for the holidays. We arrived in Seattle on Dec. 31st and found a place to live on New Years Day. Maybe it's because we're from NYC that we were so overwhelmed by the fact that we could rent a whole house (for less than our NYC apt) that we took the first nice thing we saw but we were very excited to find a lovely craftsman to move into. Now, I needed a new desk. 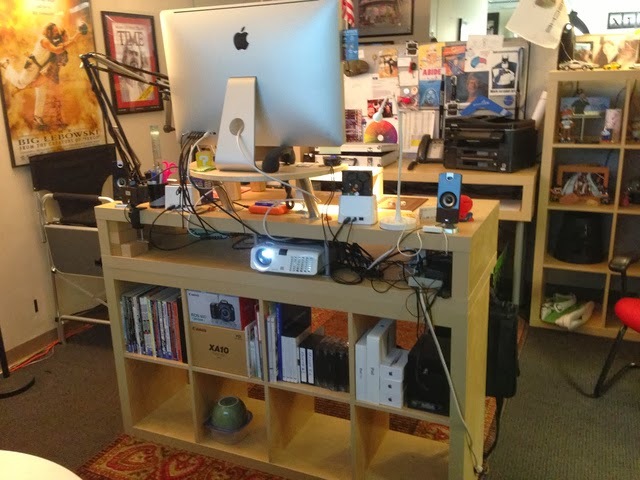 I've been hearing so much about the benefits of standing desks that I thought I could probably make my own. I didn't want to pay over $1400 for one and I wanted to make sure it was built to my exact ergonomic and spacial needs. 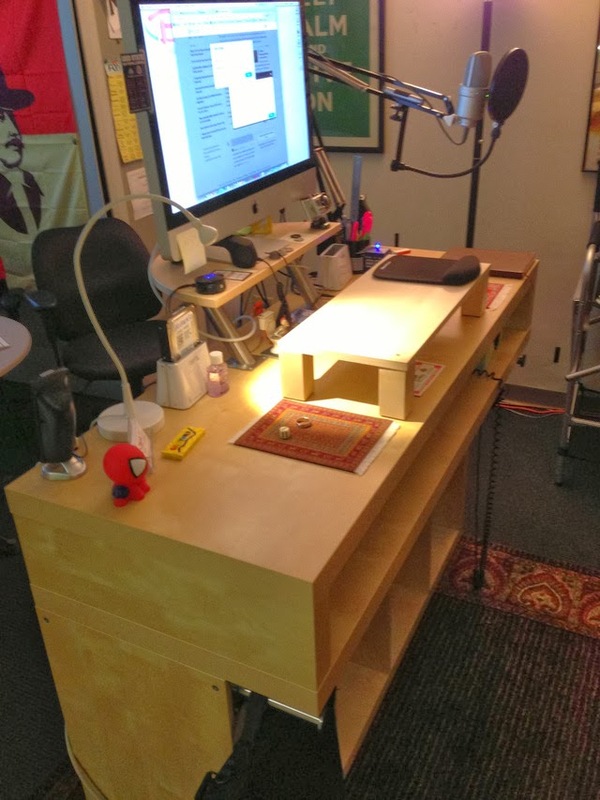 I found a few DIY standing desks online but I didn't love them. Too big. Too small. None just right. So this is what I went with for inspiration. Thanks Benjamin (wherever you are)! I made a few modifications and with the exception of a few bolts I only used the stuff I got from IKEA. Place the TV stand on top of the shelving unit (which should be on its side). I centered the TV stand to the shelving unit leaving an over hang in front and in back. I did this for 2 reasons: one is that I thought it looked more stable and two this gave me a nice bit of TV stand to secure the Desk Extension to later. Bolt the TV stand to the bookshelf. There might be a better way of doing this but I wanted to do this as cheaply as possible. Drill the holes** (carefully) and place the bolts. The 4.5" bolts will give you plenty of leeway here since the thickness of the stacked units is about 4". I placed the bolts in the center of the bottom of the TV stand with one to the right and one to the left. **note: If you already put the top of the TV stand on, it's easy to pop it off to drill the holes and place the bolts. It will pop right back on. At this point the surface of the desk will be about 41" high. I needed 43" give or take so this was perfect for me. 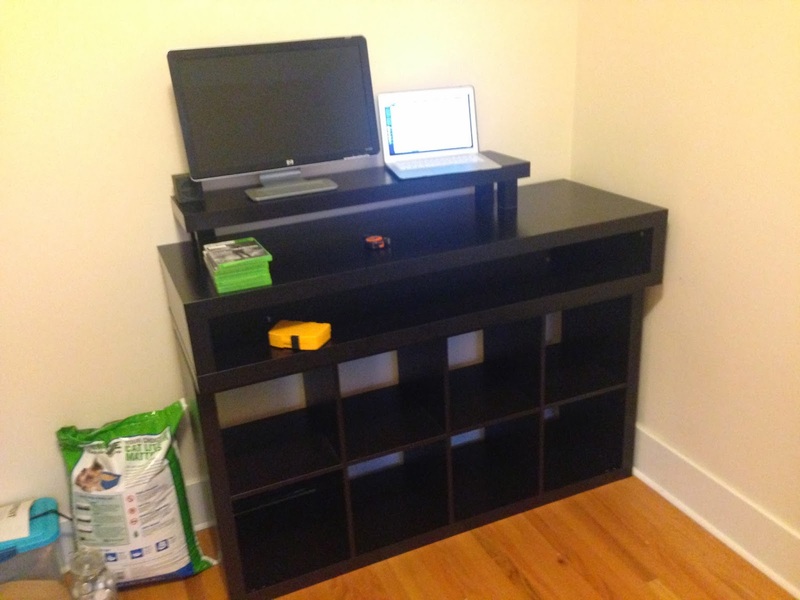 Take the Lack Shelf and attach the legs of the TV stand to it to give you a nice monitor shelf. 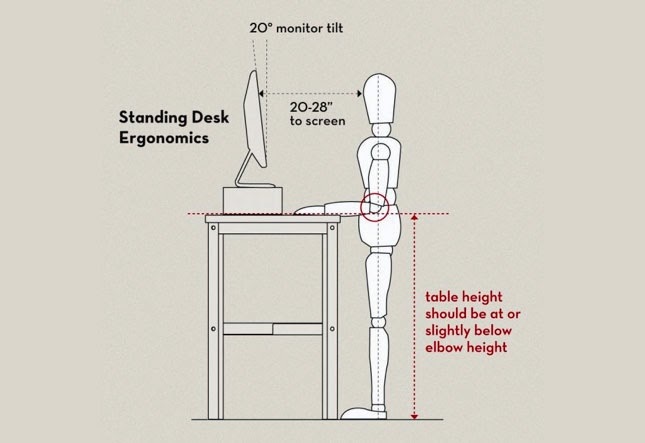 This raised my monitor just enough to meet the height requirements illustrated above. I attached the legs by creating holes similar to the holes needed for the little wooden pegs, inserting the pegs and then I used wood glue to attach it all together. I did not attach this piece to the desk as I felt like I might want to move it around when needed. Now the trickiest part of the whole build. 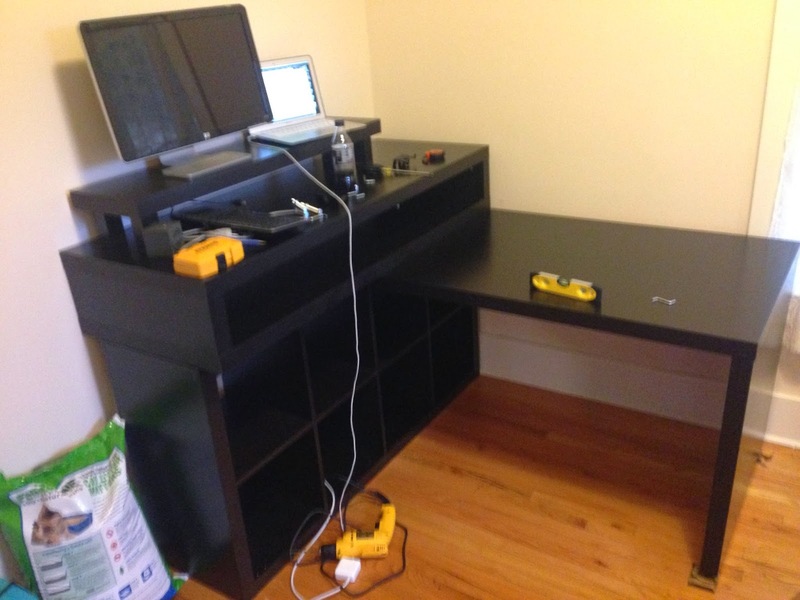 I wanted to have a place to sit if needed and I have a lot of desk clutter that I need surface area for so I thought I could just throw on the Expedit Desk and be done.... not so easy. When the Expedit shelving unit is on it's side the Desk won't line up the way it's meant to so I had to do some tweaking and by tweaking I mean drilling holes and bolting the thing to the bottom of the TV stand unit. I used the left over bolts from the TV stand legs and it worked beautifully but you'll have to use something to raise the desk up as it's not tall enough to match the height (even with the height adjustment screws attached). If anyone has any tips or tricks to improve this I'd love to hear them. Oh and by the way.... we're loving it here in Seattle! Note: If you don't watch the show or aren't caught up I don't recommend reading this post due to possible spoilers and fan-boy nonsense. Yes, I am a Breaking Bad fan-boy. 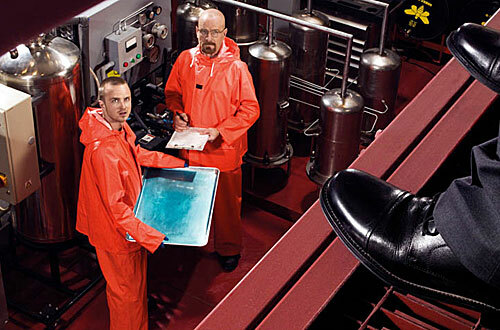 Breaking Bad has some great marketing going on in its fictitious little world. I'm a little late with this post but the branding and marketing tips that were present in last week's episode To'hajiilee were fantastic and worthy of a call out... even if it is a week late. "It's our brand" insists Lydia as she pushes for higher quality and customer satisfaction. She knows that she may even be able to push through a lesser quality if they can maintain the look that Walt created because that is what the customers are expecting. I was at a Halloween party last year and there was a guy dressed as Walt's alter-ego Heisenberg and as recognizable as that outfit was, it was the baggy with 'blue meth' hard candy that really sold the costume. With that little detail there wasn't any doubt as to who he was. The genius here is that it isn't even a real product and we all know it so well. The blue color Lydia is referring to is absolutely their brand. 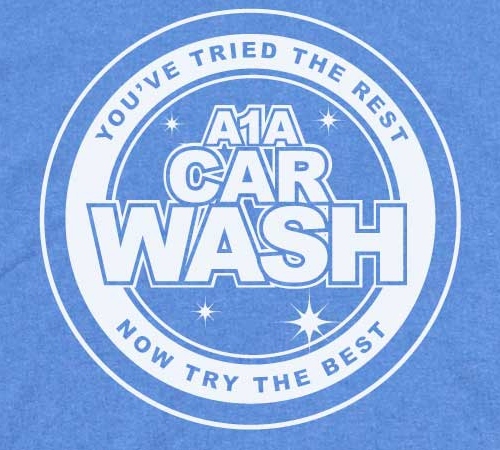 ...which is where A1A unfortunately fails in my book because their already weak slogan is different than their even weaker marketing message "You've tried the rest, now try the best." Ugh. Could you be any more cliche? I have a huge problem with any marketing message that claims that some product is 'the best'. You're immediately challenging the customer to find reasons that you're product isn't the best. Not a good move in my opinion. Be truthful, be consistent. Be like Saul, he's not trying to be anything he's not. #1. Maintain brand consistency and deliver to your customer's expectations. It's what your customers know. There are plenty of history lessons to look at where companies changed their brand drastically (ahem, Coke) and they paid a price. It is worth it to push on this.... even against a group of violent skinheads! #2. Once you finally nail that great slogan, logo or even colors that work for you then be consistent and use them whenever possible. Respect your choices. Even if they aren't that great in the grand scheme of things they will become the identity of your brand and your customers will come to expect that. Remember how changing their famous logo worked out for Tropicana? #3. Have a clear value proposition. What are you selling? Saul is selling himself as a sleazy lawyer and it works. His slogan is also a call to action and he uses it over and over. He even stays on brand when he says to Walt Jr. "Don't drink and drive but if you do, you better call me". 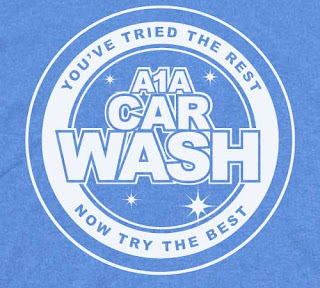 A1A Car Wash has some clear branding issues but at least you know that you're probably going to come out with a clean car when things are all said and done and the hero product, the blue meth makes the subtle promise that it's not quite like anything else on the market. Deliver on your promises and you'll build loyalty. Can't Buy Music On Your iPhone? I had just bought a new iPhone 4S and like a lot of iPhone users I upgraded it to iOS6 and something really strange happened. My battery to die at an alarming rate even if the phone was locked and 'sleeping'. I researched post after post and tried everything I could and something I did eventually worked - my battery was back to normal. Now, I have no real clue which of the 20 things I tried actually worked (that's for another post) but I did notice a very strange side effect: I could no longer purchase music from the iTunes store on my phone. I could buy Apps but not songs. The prices were all grey'd out. It was clear to me that some setting I had messed with had caused this to happen. Enjoying my newly restored battery life I wasn't really in a hurry to undo any of those settings. Have you noticed the title of this blog? Yeah. So I suffered a bit completely unable to buy that new track that I must have right now ... gah! A few weeks went by and damn it - I needed some new music so I went to the Google. Nothing. Well, nothing that was really relevant to my issue. Then, as I was poking around the iTunes store I realized that I could buy explicit music and thought that was really strange and I suddenly remembered a setting in the Restrictions that specifically enabled Explicit Music and that I had turned that on at some point. So rather unscientifically I just disabled all restrictions and BAM! I could buy all the music again (and I did... I bought all the music). I had initially enabled restrictions to disable Safari because one poster on the Apple forums suggested it could be hogging up battery power. Since I've disabled restrictions I've found that disabling Safari was not the culprit for the sudden battery suicide so that's good. Welcome back Safari and welcome back music. For the record, I now prefer the Chrome app for iPhone web browsing. Hope this helps anyone having the same problem. I heard this quote for the first time last night and much like Ira, I wish someone had said this to me 15 years ago. Oh, the countless projects I gave up on just because I felt like they weren't good enough. I'm happy that I've mostly passed that hurdle today. Today, this quote is a good reminder to just DO. "Nobody tells this to people who are beginners, I wish someone told me. All of us who do creative work, we get into it because we have good taste. But there is this gap. For the first couple years you make stuff, it’s just not that good. It’s trying to be good, it has potential, but it’s not. But your taste, the thing that got you into the game, is still killer. And your taste is why your work disappoints you. A lot of people never get past this phase, they quit. Most people I know who do interesting, creative work went through years of this. We know our work doesn’t have this special thing that we want it to have. We all go through this. And if you are just starting out or you are still in this phase, you gotta know its normal and the most important thing you can do is do a lot of work. Put yourself on a deadline so that every week you will finish one story. It is only by going through a volume of work that you will close that gap, and your work will be as good as your ambitions. And I took longer to figure out how to do this than anyone I’ve ever met. It’s gonna take awhile. It’s normal to take awhile. You’ve just gotta fight your way through." Who is your first customer, and why? Who is your FIRST customer and why? Great question. One that for me immediately puts any project in perspective. Full disclosure: my friend is actually my boss and he said this to me in person regarding something we're working on and it was the perfect place to focus my energy. I think big. Very big and then back up and focus on the details. That works for me in many ways but as a product manager any product is about the customer and that first one is the most important. Here I was, creating personas, detailing out feature lists and conducting surveys and getting a bit overwhelmed when I just really need to start by focusing on this one person. Who where they? What is this one persona and what is their story? That first person has the potential to be your biggest ally in the market. Making your project rock for them is only going to help. I'm always curious about how others approach personas. Feel free to leave any tips in the comments.